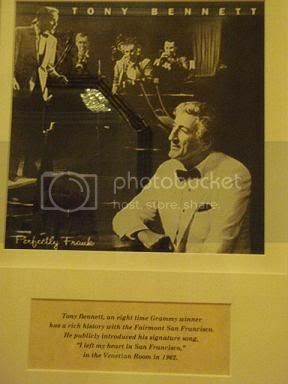 It was Tony Bennett who first sang "I left my heart in San Francisco" at the Venetian Room of Fairmont Hotel in 1962. He is now in his 80s. Many people in Asia who have not been to San Francisco or do not know much about San Francisco (like me) know it through this song (and the post card fog covered Golden Gate Bridge). People may laugh if I say I went to Fairmont Hotel to experience the sense of history when that song was first sung. Or if I say that I stood in Portsmouth Square in the heart of China Town and tried to picture what it was like when Captain Montgomery first raised an American flag there back in 1846. In fact it didn't feel like that long ago. I saw old Chinese men gathered in small groups, squatting, happily playing their Chinese checkers, gambling with small amounts of money - just like the old days in any back streets in China. Certain things just don't change. As my husband sometimes says, "you can take the man out of the boy, but you cannot take the boy out of the man." The 1848 gold rush saw 12,000 Chinese men joining the foray from across the Pacific and resulted in the oldest, and possibly the largest, China Town in America today. I often wondered why San Francisco is called "Jiou-gin-shan" in Mandarin (meaning "old gold mountain"); so that's why. That was a part of overseas Chinese history that is very foreign to me. And I can't believe I came to downtown Berkeley. I heard there were a lot of Chinese in California even back in those days when I was studying in Boston, so I avoided the west coast as much as I could. UC Berkeley was founded in 1868, a very old school indeed, only 20 odd years after Captain Montgomery came to California. I walked into a bookstore in the campus called Ten Thousand Minds on Fire, and what did I find? A poster announcing a concert by the young Chinese pianist Lang Lang ("the hottest artist on the classical music planet" according to The New York Times) on 8th September in UC Berkeley; student ticket $10. See, if you are a student you get great deals (and your teachers love you). One great luxury about being in a baking course is that you get to "waste" as much flour as you possibly can (everything in the end goes conveniently to a recycling bin which goes to happy pigs somewhere). We learnt sourdough made with white starter, made with whole wheat starter, made with rye starter, and with starter which was on a cycle of one feeding a day and two feedings a day, and with starter 40% of final flour, 70% of final flour; and with dough that was bulk fermented or fermented at proofing stage. We had worked with different types of flours - spelt, rye, semolina, whole wheat, and high extraction flour as well as seeds and nuts. We had worked with different types of pre-ferments - poolish, sponge and pate fermente (old dough left over from last bake) as opposed to starter to see the difference in bread flavor profile. We also learnt retarding in bulk and in proofing stage and the resulting variations in dough strength required. Behind all of these are two key concepts - fermentation and strength, in an effort to achieve a balance for the characteristics that we want in bread. 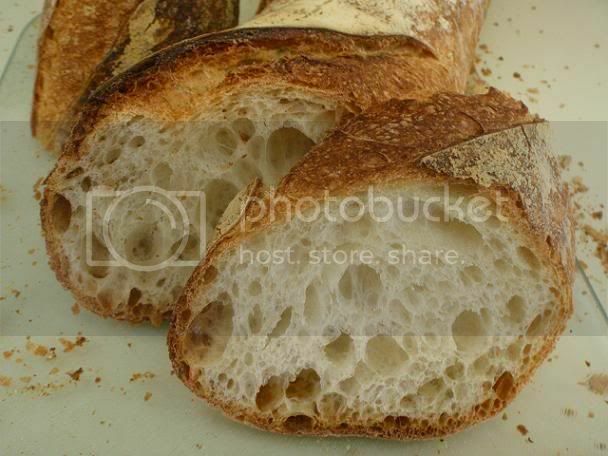 With this post I am doing a plain sourdough with just white starter; for me this is something like after a long, marathon like, but enjoyable, dinner, before you go home, you want something simple to cleanse, maybe not your palate, but your mind; that is, to lighten up your mind, before you take on the long journey home. So, not too heavy, please. Mix all ingredients until well incorporated and allow to ferment for 6 hours at room temp of 65 - 70F. Mix all ingredients in first speed of your mixer until well incorporated about 4 - 5 minutes. Scrape dough out into a lightly oiled container, give it a fold, and cover. First fermentation 1 + 1/2 hours with one fold in the container after 45 minutes. Turn dough out onto a lightly floured work bench. Divide dough to 2 x 500 g and pre-shape to cylinder. Rest for 20 minutes and in the mean time dust linen with rye flour. 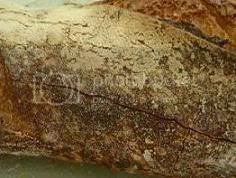 Shape dough into thin batards with pointed ends. Place shaped dough on linen seam side up and cover the dough with plastic bag. Place the whole thing into your fridge to retard overnight. An hour later, steam the oven, score the batards three times down the center line, then load the dough onto your baking stone, steam again. Bake for 35 minutes. Bake for another 5 minutes with oven door ajar to let the crust dry out more. Cool on rack before slicing. For relatively low hydration (67%), this sourdough has quite an open crumb. This dough will make for a great sourdough baguette too. The flavour is very much to my taste, mildly sour but complex with a long lasting after-taste. With this post, I am going into the air, flying home tomorrow, and I don't know when I will return next; it was like 25 years ago in Boston, I thought I'd never come to America again in my life (flying was such a big deal then), so I did as much travelling as I could within the States, the furthermost west I'd gone to was Columbus, Ohio, to listen to New Orleans jazz. And for some reason I forgot I didn't have a return ticket to go home! If not because towards the end of my semester a big multinational corporation offered me a job and to fly home (I was not a seeker of a job then), I might still be like a dog gone astray in the streets of America! So many thoughts and feelings in one message! And so beautifully expressed, as usual. The bread looks wonderful, too. Have a safe trip back home. 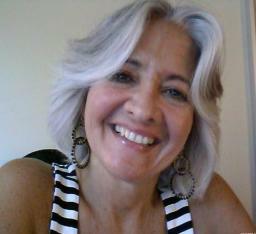 I am looking forward to seeing how you apply what you learned at the SFBI. I have high expectations. I always look forward to your stories and your excellent bread formulas and pictures. So much to learn and enjoy. Thank you for the hints ... there are aways a few gems in your posts. p.s. I like those Very stylish pointy toes! ...about your different experiences in San Francisco (in and out of your baking course) and am also waiting to see how, what you learned, might affect your future creations. Shiao-Ping, A lovely story and the bread is fantastic! I enjoyed it all so much and the memories it brings back! Ahhh! Tony Bennett! Growing up in Las Vegas...back in the good old days. I had the previledge of seeing to many to name famous people and stars. It was a wonderful time! One singer I most loved was Dionne Warwick when she preformed song after song of Burt Bacharach's while he played the piano. He picked her because I remember my Aunt telling me...he said she had the voice to do all of his songs! but don't listen to her songs very much any more. Some songs belong to a phase in our life. Thanks for your comment, Sylvia. 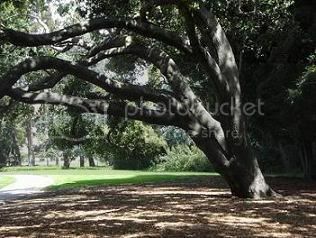 I hope you don't mind, Shiao-Ping, but I copied the first photo of the trees to two artistic friends of mine. (They are not commercial artists. One is my sister, a stay-at-home mom who enjoys painting in her spare time, and the other is a 9-year old girl who is showing some talent.) I thought the interplay of light and shadow beautiful, and probably good practice for beginning painters. I really love it. You are most welcome. 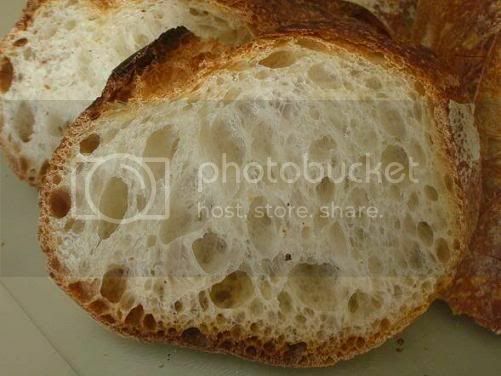 I uploaded the original shot onto the web for you; you might get better definition out of it: http://picasaweb.google.com.tw/shiaopinghu/Sourdough491?feat=directlink. Thank you for your comment. history, beauty and reality. You have a unique gift in your baking and writing. Artiste. You are a jewel, Shaio Ping. You are a jewel, Shaio Ping. And your breads are invariably spectacular and inspiring. Thanks for a beautiful experience! Love your brick oven too. If you want to consider writing on a freelance basis, I can point you to some links you can try out (although I suspect you're already an established writer). By the way, the issues arrived today and wanted to thank you again for including my name on the mailing list for James McGuire's pain de tradition. These issues should put me on the right path to his most eloquent bread. Everyone's situation is different. When we lived in Singapore and Malaysia, almost all our friends were expatriates. We found the expatriates who'd lived there for a long time generally love it there and the longer they live in Asia, the more they love it and not contemplate ever returning to their "home" countries. "Home" is a shifting concept. At the end of the day, "home" is you; you are home; wherever you are, it is home. I have not lived in my "home" town since I was 18; and maybe I am lucky in that regard. 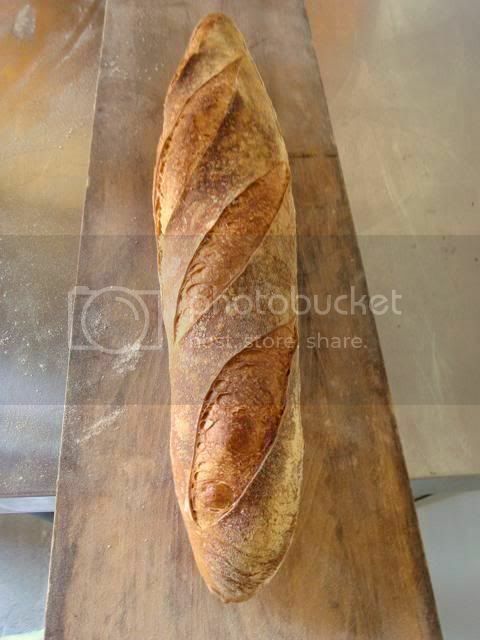 The batard is stunning - it could easily grace the cover of a cookbook. And your story holds its own as an accompaniment! Obviously you had much more than merely a good time at SFBI. In your recipe, you mention "bread" flour. 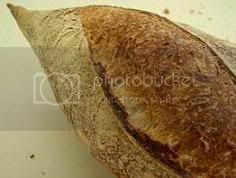 When you say "bread" flour, are you referring to some kind of "Unbleached All-purpose" or a higher gluten flour such as King Arthur Bread Flour? 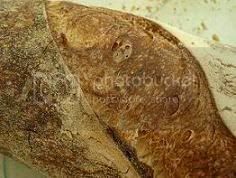 the bread flour is just any unbleached bakers flour (white flour). King Arthur all-purpose flour would be fine too. I'm not having much luck with KA All-purpose. But, I have had better success with Giusto's Artisan though. Better flavor. Better Crumb. Overall feel of the dough is good when using this flour. I do add in a small percentage of KA Bread flour. 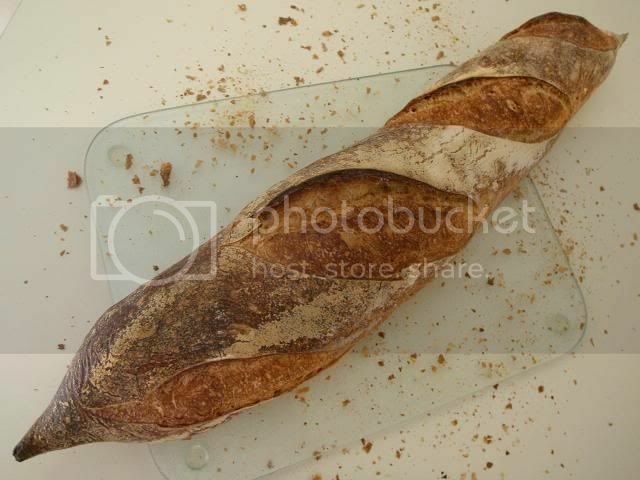 Your baguettes were absolutely gorgeous though. Works of art! If only I could get mine to look as good. and see no reason why you need to use other flours unless you want variety and to experiment.